A comprehensive new cycle of the Beethoven sonatas recorded live at London's Wigmore Hall during the pianist's epic fourth rendition of these masterpieces . In the last year of his life Beethoven complained that the piano was, and would always be, an unsatisfactory instrument. Already a decade earlier, with his colossal ‘Hammerklavier’ Sonata Op. 106, he had made unprecedented demands on the pianist’s stamina and powers of concentration, as well as on the capability of the instrument itself to reproduce sonorities of orchestral weight and grandeur. Beethoven may have been dissatisfied, too, with the piano’s lack of a true singing tone. During Beethoven’s lifetime the piano had nevertheless been undergoing continual development, both in terms of its sustaining power and the compass of the keyboard itself. Up to the time of the ‘Waldstein’ sonata Op. 53, of 1803-4, Beethoven had to content himself with the five-octave range that had been in use ever since the days of Haydn and Mozart. While the restricted keyboard compass did not seem to have been a compositional hindrance to Mozart, who never failed to find elegant solutions to its constraints, Beethoven’s earlier sonatas constantly strain against the limitations at both ends of the keyboard, implying the necessity for notes that were not available. By the time Beethoven came to compose the ‘Hammerklavier’ sonata, the piano had acquired a range of just over six octaves, which seems finally to have satisfied him. 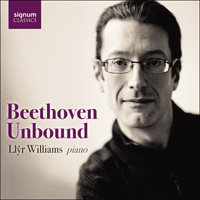 Beethoven’s 32 piano sonatas form the richest body of such pieces ever created by a single composer. They are remarkable not only for the originality and profundity of their invention, but also for the variety of their form and character. That diversity was recognised as early as 1807, when a review of the Op. 22 piano sonata published in the Zeitung für die elegante Welt pointed out that “Beethoven’s inexhaustible genius gives each of his works such an individual character, that it is not easy to compare any one with another.” It is as though Beethoven were determined to show how many different facets of his creative persona he could display within the same genre. Even works written more or less simultaneously, and gathered together within a single opus number, are utterly unalike. Only the final triptych of sonatas, Opp.109, 110 and 111, with its preoccupation with variation and fugal procedures, finds Beethoven exploring common territory, though even here the outward shape of each successive sonata is wholly different. By far the greater proportion of Beethoven’s sonatas date from the earlier part of his life, before increasing deafness made the continuation of his career as a keyboard virtuoso impracticable. More than two-thirds of these works were, in fact, composed within the space of a decade, from the mid-1790s to 1805 – the year in which the ‘Appassionata’ Op. 57 was completed. Beethoven had made his first attempts at composing piano sonatas when he was only twelve years old, with three works dedicated to the Elector of Bonn. They were published in 1783, though they are clearly immature pieces and do not form part of the accepted canon. That canon is inaugurated with the three sonatas Op. 2, all of them grand works in four movements – a design also found in the composer’s next sonata, Op. 7. But as the 18th century gave way to the 19th Beethoven became increasingly attracted to more condensed designs, and to notions of continuity between successive movements. The two sonatas Op. 27, of 1801 (the second of them is the famous ‘Moonlight’), tread the borderline between sonata and fantasy, and the first of the pair is Beethoven’s only work of its kind to play continuously from beginning to end. Its concluding page brings back a fragment of the earlier slow movement, thereby anticipating the new approaches to cyclic form found in some of the sonatas of Beethoven’s final years. Mozart’s shadow can be detected in Beethoven’s Sonata Op. 10 No. 1, his first solo piano work in what was to remain his most characteristically defiant key of C minor. For all the music’s strongly Beethovenian character, it unmistakably reveals the influence of Mozart’s great C minor Sonata K.457. But Count Waldstein would have had much more difficulty in tracing Mozart’s spirit in the sonata Beethoven dedicated to him some seven or eight years later. The ‘Waldstein’ sonata, like the ‘Hammerklavier’, is a work that seems at times to be conceived in orchestral terms, and one in which Beethoven makes the entire piano resonate with the aid of the sustaining pedal. The effects used in the concluding rondo of the ‘Waldstein’ are largely of a new kind, too: glissandos in octaves for both hands moving in opposite directions; and technically awkward trills played by the thumb and first finger of the right hand, while above them the remaining fingers play the sustained rondo theme, and the left hand rushes up and down the keyboard in rapid scales. The whole texture is one of shimmering virtuosity, and seemingly designed to thwart the efforts of amateur pianists.